Most grocery stores in the U.S. have their produce shipped in from all across the globe. Very little of it is grown locally, especially if that item is not in season. That is how I can eat watermelon in Illinois in January. Because the fruits and vegetables require many days or weeks to be shipped great distances, the produce must be picked before it is ripe. This means that normally the produce is still not ripe when it reaches the store. Peaches are a good example. I almost never find a ripe peach in the store. Most of them look ripe, but they are hard as a baseball. I buy them anyway, knowing that they will be ripe in just a few days. The trick is knowing the right way to accelerate the ripening process. To determine the most effective way to ripen fruit, let’s do a little experiment. There are two main things that people do with fruit when they bring it home from the store. They either put it in the refrigerator or put it in a bag on the counter. Let’s test these options and see what gives us better, more ripened fruit. First get 2 unripe peaches. 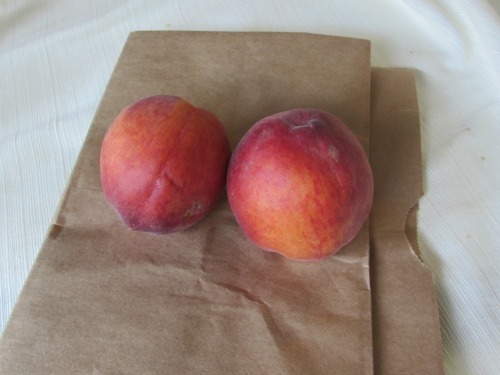 Place one peach in the crisper drawer of the refrigerator, and place the other peach in a paper bag, seal it, and put it on the counter. Let these peaches sit for 1 or 2 days. After a day or two, feel and taste the peaches. Both peaches will get softer. They won’t feel like baseballs anymore. However, the taste is where the difference lies. The peach in the paper bag will taste sweet, while the peach in the refrigerator won’t be very tasty at all. Why the difference? As peaches ripen they produce ethylene gas. In the paper bag, this gas is trapped. This concentrated gas works to ripen the fruit. 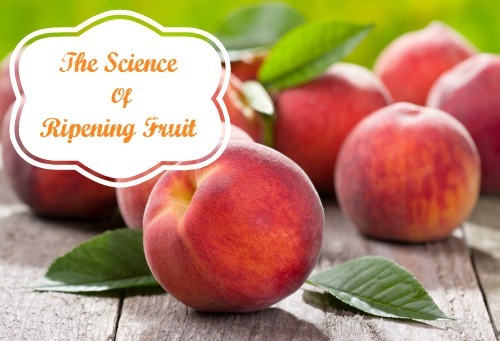 In the refrigerator, the ethylene gas produced by the peach spreads throughout the entire refrigerator and doesn’t have much effect on the peach. The peach in the refrigerator just rots, never ripens. Try this same experiment with apples and pears. They, also, produce ethylene gas.